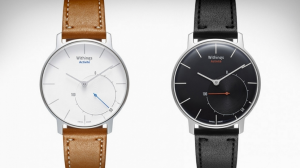 This week Withings has announced the launch of its third activity tracking smartwatch the Activité Steel. The latest edition to the Activité range, which debuted last year, will sit in between the high end Activité $450 Swiss-made wristwatch and the budget version, the Activité Pop retailing at only $150. Priced at $170, the Activité Steel creates a great balance between the low-end cost and the luxury features demonstrated in previous products within the range. Featuring a smart stainless steel body with a sleek black face, the Activité Steel looks much more impressive compared to its low end predecessor, however a silicone strap means it doesn’t quite live up the luxury of the original Activité smartwatch. In terms of visuals, the only other real difference besides the strap is the colours of the index markers and hands. So what makes this a ‘smartwatch’? Well like the other versions of the Activité range, the tracking is based primarily around steps taken and your sleeping pattern. The watch syncs with the Withings Health Mate app – available on both iOS and Android – to constantly upload your data and a small hand visible in the background of the face allows you to see your progress every day. The watch is also water resistant allowing you to take it to depths of 50m. Another great feature of the Activité Steel is a built in GPS tracker that means the watch will automatically change the time displayed depending on where you are in the world.